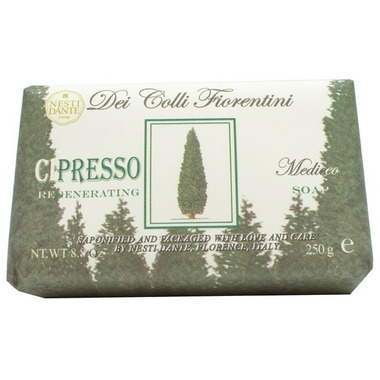 Nesti Dante Dei Colli Fiorentini Cipresso Regenerating Soap is inspired by a beautiful Florentine bouquet, a combination of Tuscan’s best Lavender, Violet, Broom and Cypress. Close your eyes and dream of lavish Tuscan Valleys. My whole family is in love with the Nesti line of soaps. The Cipresso is one of my favourites. The smell is fresh and clean. Itâ€™s got more of a sharper scent than the other soaps but thatâ€™s what I like about it. It really awakens your senses in the morning! I highly recommend the Nesti brand of soaps. I feel safe using them on the entire family. Disappointed with this product. The description on Nesti Dante soaps boast how natural they are made, without chemicals but the scent is so incredibly obnoxious. All the soaps end up smelling the same because of the Linolool fragrance they aid. It unfortunate, I was hoping for a more subtle, natural sent that was unique to each soap, as the product was described. I was happily surprised when this one arrived - the bar is huge! I love the woodsy scent. This smells absolutely amazing. Very woodsy and warm. I detect a smoky black tea note in the background which I just love. Buy this for the men in your life.